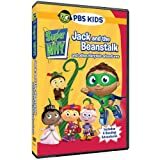 Although I’m a parent of two young girls and watch a great deal of PBS programming, I have to admit that until now I’ve not seen any episodes of Super WHY!. I was informed by my daughters that they had seen this show previously, though this was the first I’d even heard of it. Now that I’ve seen it, I can see why it’s popular with their target ages of 3 to 6. Super WHY! aims to boost literacy by providing multiple styles of learning using fairy tales as the medium. The four main characters or “Super Readers” include Whyatt Beanstalk, Little Red Riding Hood, Princess Pea, and Pig. These four characters either come directly from or are related to characters in popular fairy tales. Like many of the shows aimed at preschool or pre-kindergarten-aged children, every episode follows a repeated pattern. A story problem is introduced and the Super Readers assemble to solve it by using alphabet, word, spelling, and reading skills. Each clue they find adds one or more letters to a series of blanks that will provide the answer they need. In Hansel and Gretel: A Healthy Adventure, the Super Readers have to figure out why Red Riding Hood (or just “Red”) has no energy to play with her friends at the park. Could it have something to do with her sweet tooth? The Super Readers convince the witch to stop nibbling on her house and start snacking on healthy choices like carrots. Red and the witch both start snacking on healthy fruits and vegetables and drinking water instead of soda, which gets them back out and playing again. At the end of the epsiode, they convinced the witch to change the story so she lived in a house made of healthy snacks instead of one of gingerbread and candy. I thought that was an interesting aspect of the Super Reader’s mission and a way to invest viewers more in the outcome of the show. My daughters were hooked once the readers entered the story of Hansel and Gretel, which was great to see. And my youngest, entering kindergarten next fall, was following along with the alphabet and word aspects, while my 3rd grader had no issues with the spelling and reading aspects. However, I was pleased to see that it held both of their attentions for the duration of the episode. I was entertained by the difference between the 3D graphics used for most of the show versus the flat characters used for Hansel, Gretel, and the witch once they were in the storybook. It made it easy to see who was important as they progressed through the story and learned more. 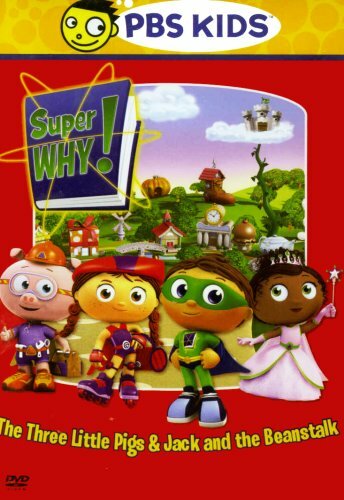 Overall, I think Super WHY! appears to be another great series on PBS. And “Hansel and Gretel: A Healthy Snack” was a fun, educational way to teach kids why eating sugary snacks is bad and healthy snacks is good! Be sure to check it out with your preschoolers and kindergarten kids. p.s. Check out these SuperWHY! adventures on DVD!